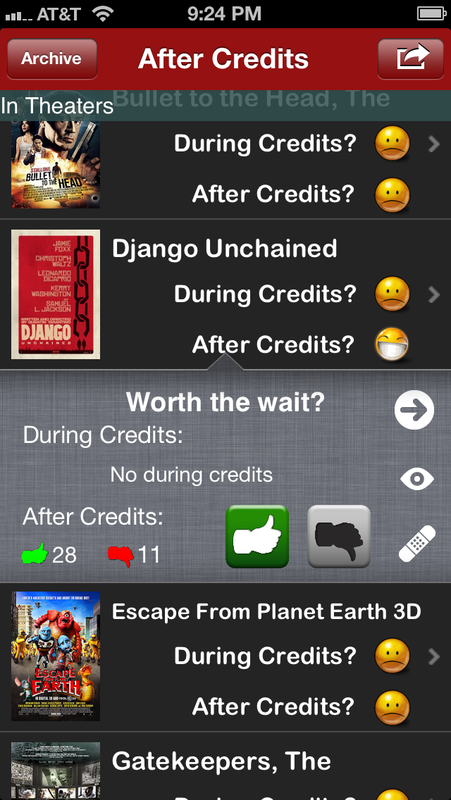 This is from a user name Sally who is a dedicated user of After Credits. This wasn’t the first feedback that wanted a spoiler-like option to see what the clip is about. However, this was the first time I saw someone post the feedback with the reason why something like this would be useful. So without further ado, spoilers are added! The eye into the future! When you tap on a movie, you’ll see a new eyeball icon now. This eyeball icon will be the spoiler button. Why did I choose an eyeball? No reason! I just thought it represents spoilers pretty well. The eyeball icon only appears if there is any clips during/after credits. Also you may also notice the table view indicator (>) is back after it’s removal from last update. Turns out some users didn’t know you can tap on it without it. When you tap on the eyeball, spoilers for During and After credits appear. This could be a short sentence or a huge paragraph depending on what users submit. Most of the spoilers that I had to insert into old movies were taken from two sites: mediastinger.com and aftercredits.com. I appreciate these sites for having these and I give credits to these sites for every spoiler that I use from them. That view also is the new alert view design courtesy of MBAlertView. It is beautiful, simple, and elegant. I might use this on all my app as it looks 100x better than Apple’s alert view. This is the new (not that new) submit/update view. 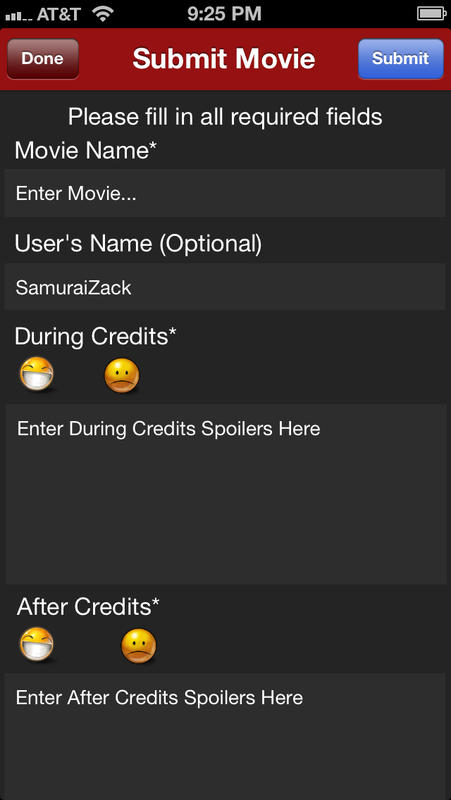 All I added was two new text views so that users could add the spoilers. 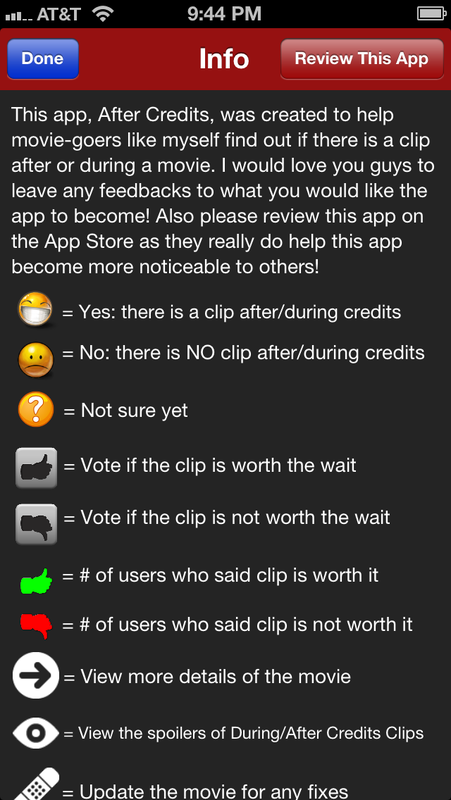 These are now required if user submits a movie that has a clip during or after credits. I have a feeling this view will be redesigned in the near future! There’s a lot of small tweaks I did so that it fits in with my more modern design from last update. The biggest one that most people will notice is the already mention new alert view and this new loading indicator up top. As you can see from the similarities, both come from the same tool MBAlertView and MBHudView. I realize that I didn’t update this info page with the last update. Some people were confused at what the arrow/bandaid did. Now when you start the app, you’ll be greeted with this new info page. Even if you’ve seen it before, I feel that there’s been so much added that you would need to see it again. I mean who would know an eyeball stands for spoilers right? This entry was posted in Uncategorized and tagged After Credits, After Credits app, Anything After, App Store, App Store Update, Apple, Applications, Clips, Credits, During Credits, iOS, Itunes, Movie, Movies, Search Movies, Spoilers, Waka Waka Zaku, Xcode. Bookmark the permalink.